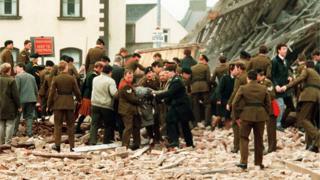 A County Armagh man who survived an IRA bomb attack in Enniskillen has said he tried to take his own life as a result of the events of that day. Joe Holbeach, from Lurgan, was injured in the explosion at the town’s Remembrance Sunday ceremony in 1987. His comments come after a victims’ group highlighted the “vast” number of Troubles suicides. The Docklands Victims Association (DVA) was set up after the 1996 attack in London. The bombing marked the end of a 17-month IRA ceasefire at the time. The group, based in Great Britain, has published a study based on feedback from its members. In response to a government consultation on addressing the impact of past violence, the study looked at the problem of suicide. The DVA has called for more support from the government, which launched the public consultation process on the legacy of the Troubles in May. The four-month consultation will close on 10 September. The DVA will deliver its report to the Northern Ireland Office (NIO) in London on Tuesday. Mr Holbeach said he had been “haunted” by what he had seen and what he still felt. He said he felt “abandoned” by the government. “If UK and Irish victims had US passports we would have been compensated by Gaddafi. Jonathan Ganesh, president of the DVA, was severely injured in the Docklands attack. He told BBC’s Good Morning Ulster programme the problem of severe mental health issues in Troubles victims was an “epidemic”. “The DVA has been astonished to discover that a vast number of victims have attempted suicide or committed suicide many years after the initial terrorist incident due to debilitating mental health conditions such as PTSD or other mental health conditions. “The reluctance of UK governments, including government-funded support groups, to address these increasing mental health conditions has contributed to the stigma associated with suicide. “Therefore, this must be addressed and a specialist unit staffed by accredited mental health workers must be established,” he added. Mr Ganesh said the group believed victims based in Northern Ireland have received better support, care and funding which has been denied to those elsewhere. A government spokesperson said: ‘The UK government wants to hear the views of all people affected by the Troubles, including many from outside Northern Ireland whose lives have been affected. If you are in the UK, you can call the Samaritans on 116123 or Lifeline on 0808 808 8000.